As you know, reality is projected illusion through the eye of the pupil or the consciousness of the experiencer. Apparitions are projected illusions from a parallel reality program. By definition an apparition is an appearance to a human of a ghost, phantom, or other supernatural being such as God or Satan, or an appearance of a living person not physically present by ostensibly supernatural means. This goes to Marion Apparitions among others. Through the years, I have heard many stories from readers, clients, and non-metaphysical people, about the apparitions they have witnessed, linked with ... time travel and M-Theory, other. I remember an email sent by a reader named Anna, who lives in Palm Springs, California. One day Anna was sitting in her living room, when suddenly the apparition of a woman dressed in 19th century attire appeared before her. She watched the woman hanging clothes on a clothesline on a sunny day. Their projections overlapped, same space, different timeline, and I am sure by now you have figured that we are projected illusions as well. In Anna's experience, she saw the woman, but the woman did not see her, or did not appear to be witnessing anything out of the ordinary. A mirage, derived from the Latin mirari, meaning 'to be astonished', is an optical phenomenon which often occurs naturally. The kind most commonly seen (known as inferior mirage, because the inverted image lies below the upright one) is produced by the refraction of light when it passes into a layer of warm air lying close to a heated ground surface. This is an example of gradient index optics. In deserts, mirages may give the appearance of a lake or other large body of water in the distance; this is actually an image of the sky being refracted back up from the warm air lying over the sand. On tarmac roads, mirages give the impression that distant objects are being reflected by a puddle of water on the road. 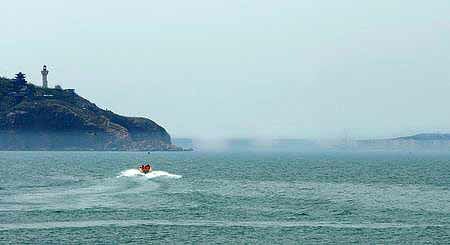 A mirage appeared off the shore of Penglai City in eastern China's Shandong Province on Sunday, May 7, 2005. 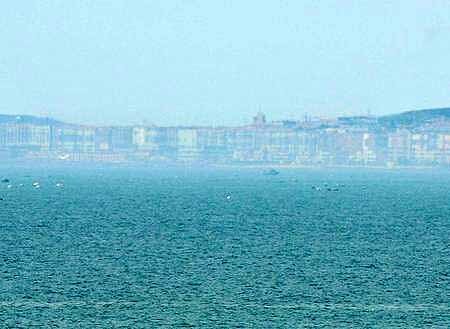 Thousands of tourists and local residents witnessed a mirage of high clarity lasting for four hours off the shore of Penglai City in east China's Shandong Province on Sunday. broad city streets, bustling cars, and crowds of people all clearly visible. The city of Penglai had been soaked by two days of rain before the rare weather phenomenon occurred. The mirage took place during the week-long Labor Day holiday. They explained that a mirage is formed when moisture in the air becomes warmer than the temperature of sea water, which refracts rays of sunlight to create reflections of the landscape in the sky.